Today, HRC is launching its first LGBT workplace inclusion survey in Chile -- HRC Equidad CL: Programa de Equidad Laboral, a groundbreaking effort to evaluate LGBT-inclusive policies and practices in Chilean companies. The survey is HRC’s second in Latin America -- HRC Equidad MX was launched last year, and recently released its first LGBT workplace inclusion survey results. Earlier this year, HRC announced its partnership with Fundación Iguales, Chile’s largest LGBT advocacy group, to promote LGBT-inclusive policies and best practices among Chilean employers. HRC Equidad CL is designed to help build stronger LGBT-inclusive workplace policies and practices, and recognize companies and multinationals in Chile fostering a corporate culture that embraces LGBT employees. In coming months, the Chile-based effort, inspired by HRC’s annual Corporate Equality Index (CEI), the premier U.S. benchmarking tool on corporate LGBTQ-inclusive policies and practices, will collect responses to the survey and release results in early 2019. 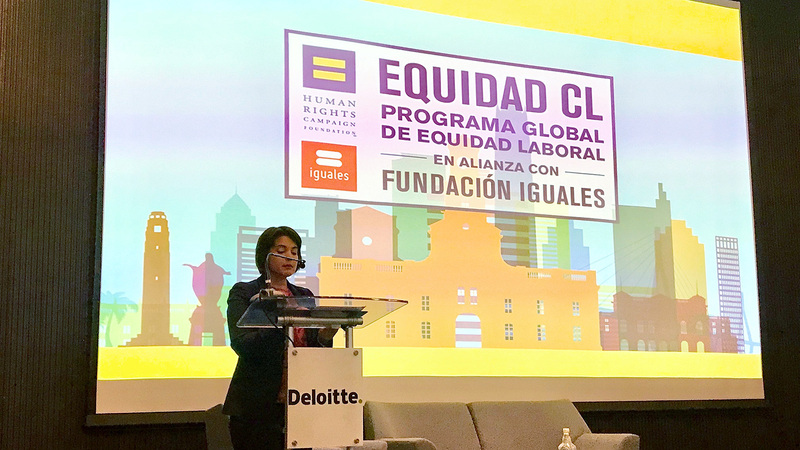 “HRC Equidad CL is driving unprecedented progress among major Chilean employers committed to invest in diversity and LGBT inclusion,” said Emilio Maldonado, Executive Director of Fundación Iguales and HRC Equidad CL Implementing Partner. “We are proud to work with HRC to continue to expand LGBT equality and help business leaders achieve optimal work environments and LGBT-inclusive policies for all employees. HRC Equidad CL recently developed a new Spanish-language business toolkit designed to help LGBT employees and allies start a dialogue with senior leaders about LGBT workplace practices. This resource is especially helpful to Latin American employers striving to create welcoming environments by investing in LGBT inclusion. Through its partnerships with local organizations, HRC is leading the efforts to advance LGBT workplace inclusion and equality in workplaces across the U.S., Mexico and Chile impacting more than 14.5 million employees worldwide . For more information on HRC’s Global Workplace Equality Programs and business toolkits, please visit hrc.im/equidadCL.